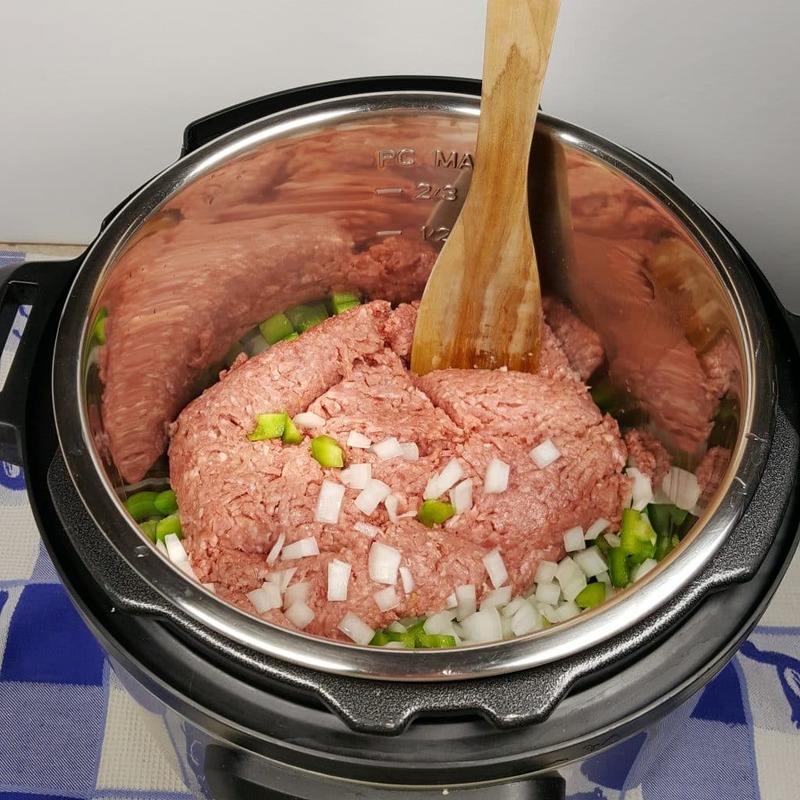 Instant Pot Sloppy Joes will make fall in love with Sloppy Joes all over again and you’ll forget about those canned sauces from your childhood..
For those who grew up in the 60’s and 70’s, you probably ate Sloppy Joe’s during grade school. So messy, but so good. After a while, canned sauces such as Manwich Sloppy Joes Sauce appeared on grocery shelves. I never liked that stuff. 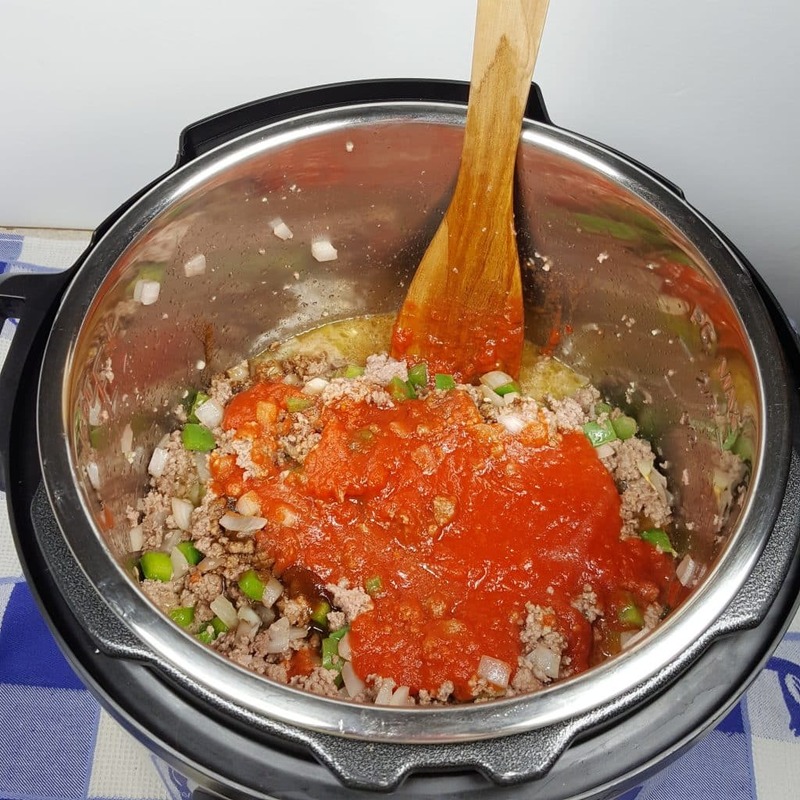 My homemade Instant Pot Sloppy Joes are the ultimate sloppy joes and are easily made in the Instant Pot, Mealthy MultiPot or Pressure Cooker. 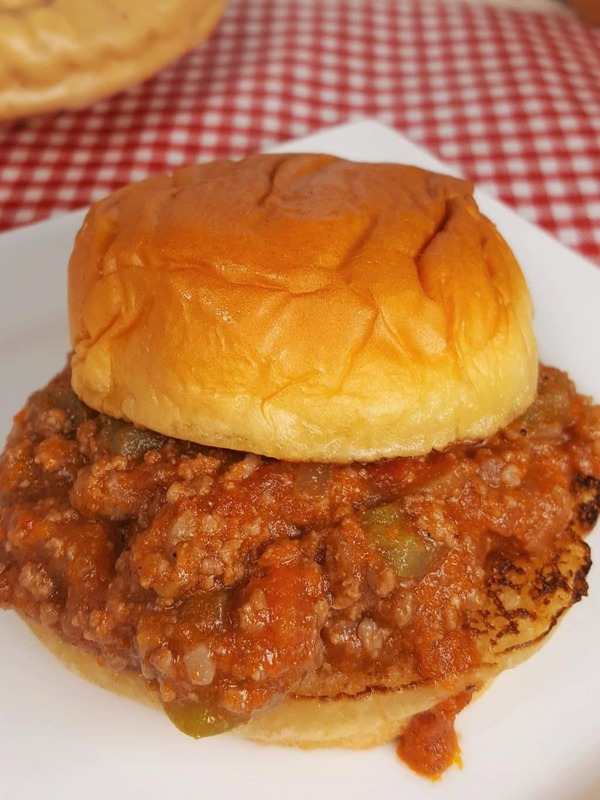 You are going to fall in love with Sloppy Joes all over again and bring back wonderful childhood memories. 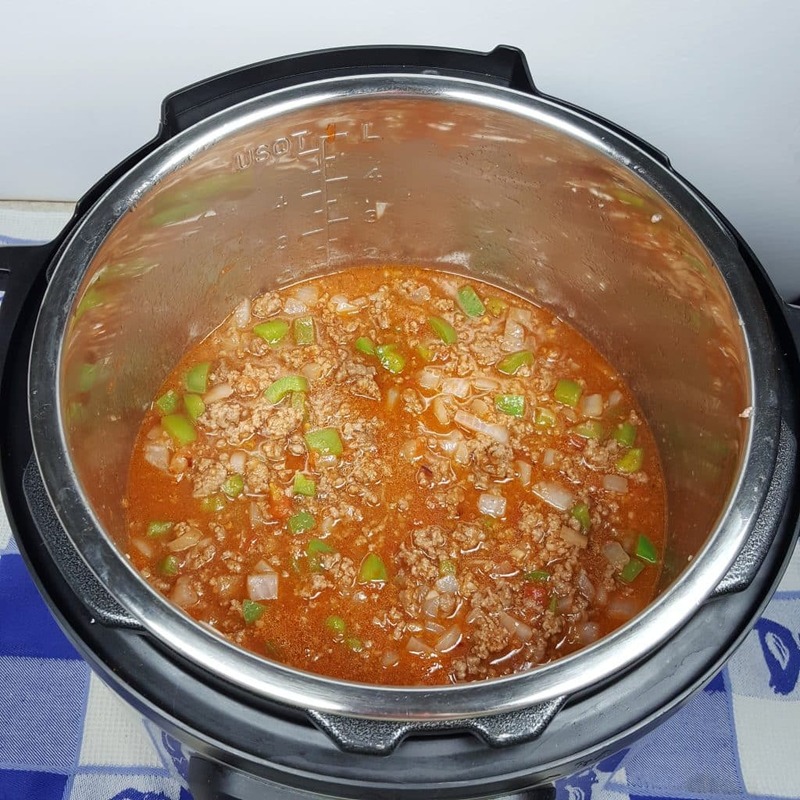 Instant Pot Sloppy Joes are the first in my series of Instant Pot Sloppy Joes recipes. What are Instant Pot Sloppy Joes? A Sloppy Joe is a sandwich consisting of ground beef, onions, tomato sauce or ketchup, Worcestershire sauce, and other seasonings. It is served on a hamburger bun. Sloppy Joe’s originated in the United States during the early 20th century. Sloppy Joe’s, never really made it around the Globe and has pretty much stayed an American tradition. It is said that back in 1930, in a cafe in Sioux City, Iowa, a cook named “Joe” add Tomato Sauce to his “Loose Meat” sandwiches. That is tomato puree you see in the photo, NOT ketchup. I did not take the easy way out. 🙂 This is really homemade, baby! 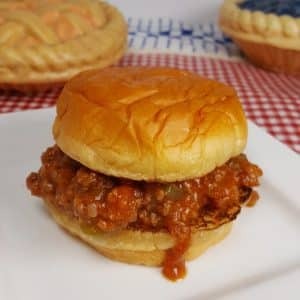 How do you make Instant Pot Sloppy Joe’s? 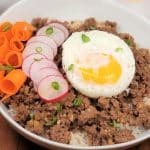 To make them in theInstant Pot, Mealthy MultiPot or Pressure Cooker, all you need to do is brown some ground beef. Dice up some onions and green peppers. Add some tomato sauce and spices. Do you use Bottled Ketchup for Instant Pot Sloppy Joes? No, as I try to use as little bottled or canned ingredients when I cook. Homemade ketchup is so easy to make with just a few ingredients. Ketchup is so sweet and making it from scratch allows everyone to adjust the sweetness level to their personal preference without worrying about other ingredients in ketchup. Otherwise, if less ketchup is added to a recipe, it may not work as intended. When using the ingredients to homemade ketchup, leaving out a little sugar only makes the recipe less sweet, nothing else. 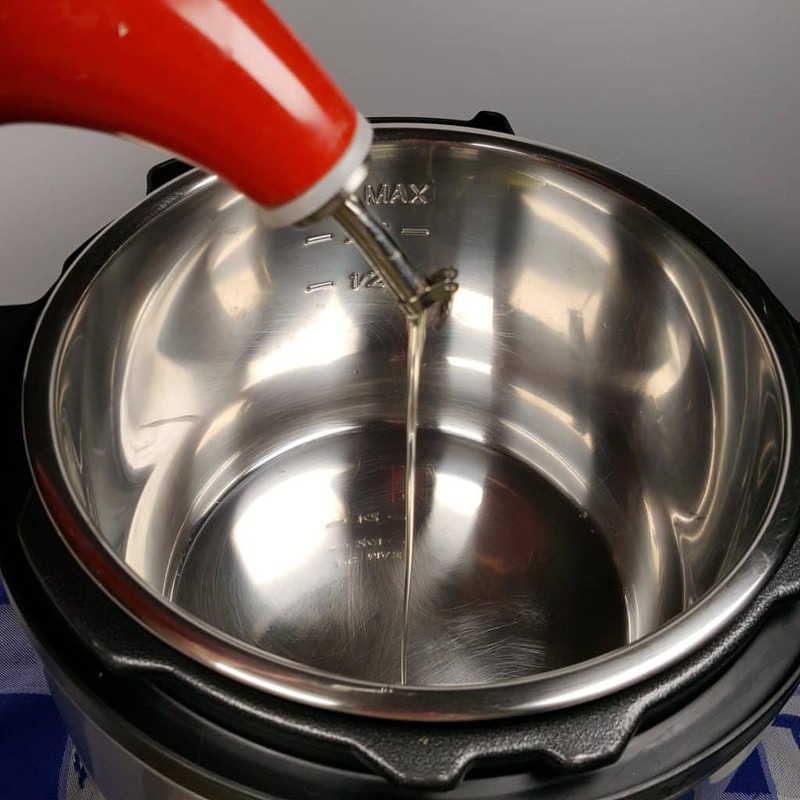 Why heat the Instant Pot Cooking Pot before adding Oil? It helps to make a stainless steel pot, non-stick. Also, if you add the oil before heating the pan, there is a chance of the oil burning, before it is time to add the food. 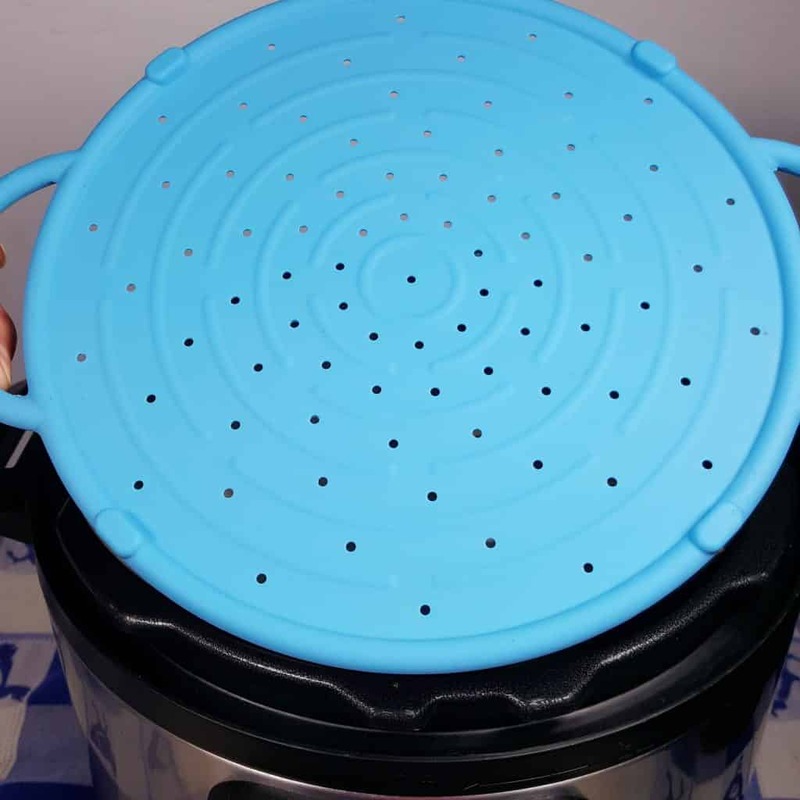 Plus, it ensures that you are adding food to a pan with hot oil, so that the food does not sit in the oil and soak in as it heats up. 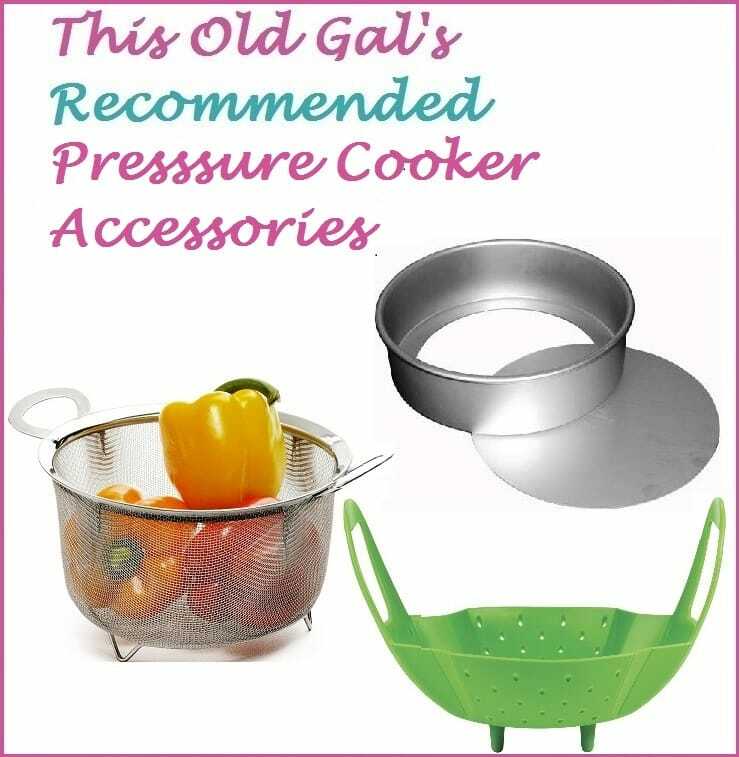 I love this Rachel Ray Oil Dispenser Set, as it makes it so easy to add just the right amount of Olive Oil to the Instant Pot, Mealthy MultiPot or Pressure Cooker. The Instant Pot Sloppy Joes recipe has such a short cook time. Dicing up the vegetables into small pieces, will ensure that they are perfectly cooked. Don’t panic at the amount of onions and green peppers!!! This Cilio Olivewood Spatula is not only beautiful, it does a great job of breaking up the ground beef. 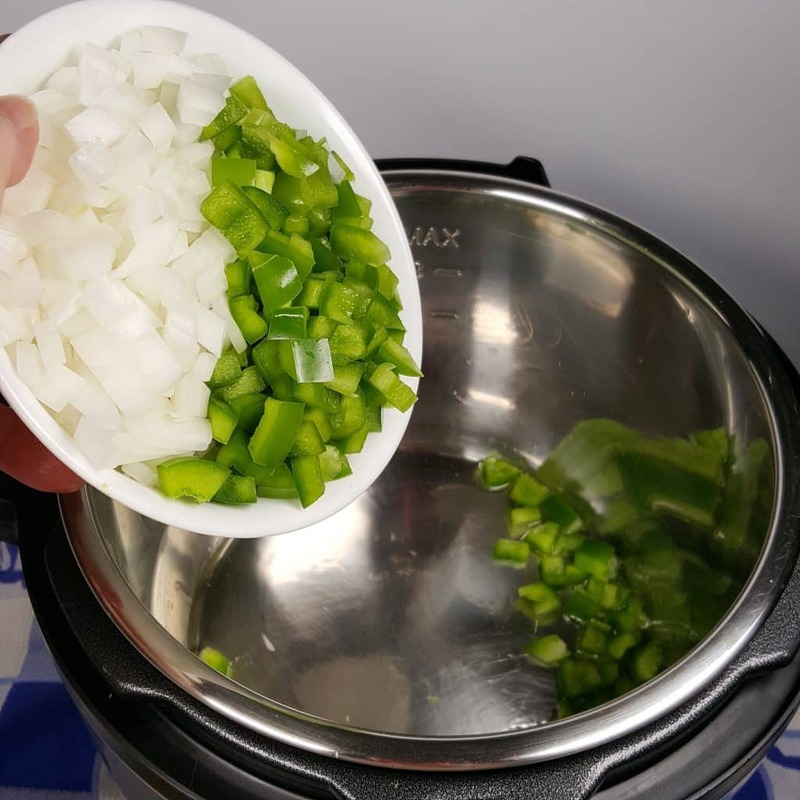 Why Cook Ground Beef, Onions and Peppers together for Instant Pot Sloppy Joes? Ground Beef is quite greasy, even when called Lean Ground Beef. Add the Onions and Peppers, will allow the Ground Beef to Brown, using less Oil. 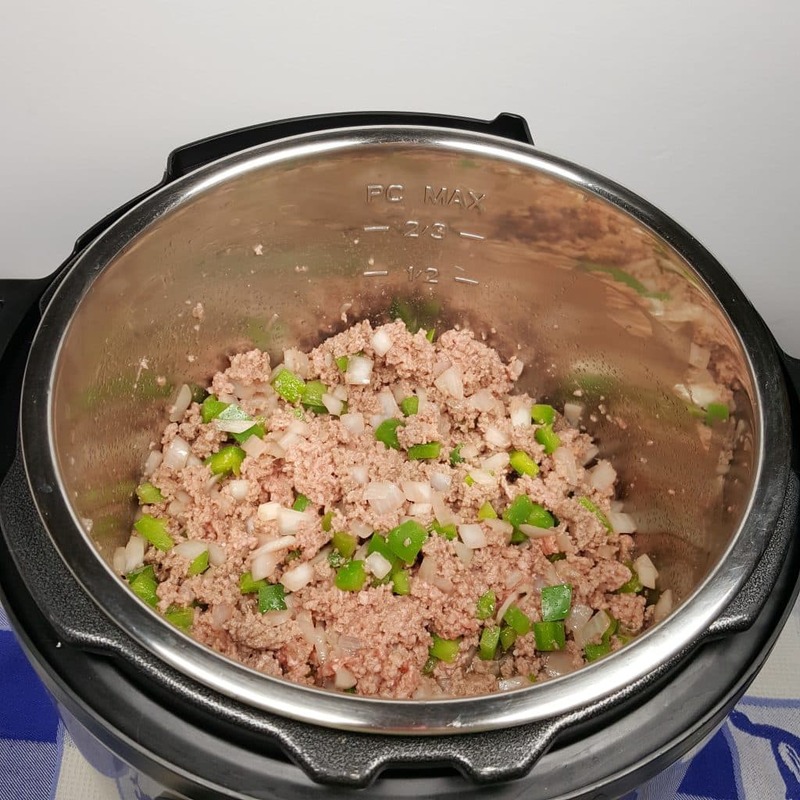 The meat in Instant Pot Sloppy Joes is soft and not caramelized and the flavor is infused throughout the meat, not just seared on the outside. Plus, the Water that releases from the Onions and Peppers, will help to guide the grease out of the meat when draining. Why drain liquid from Instant Pot Sloppy Joes? As mentioned above, ground beef, even if “lean,” will still release some fat/grease. 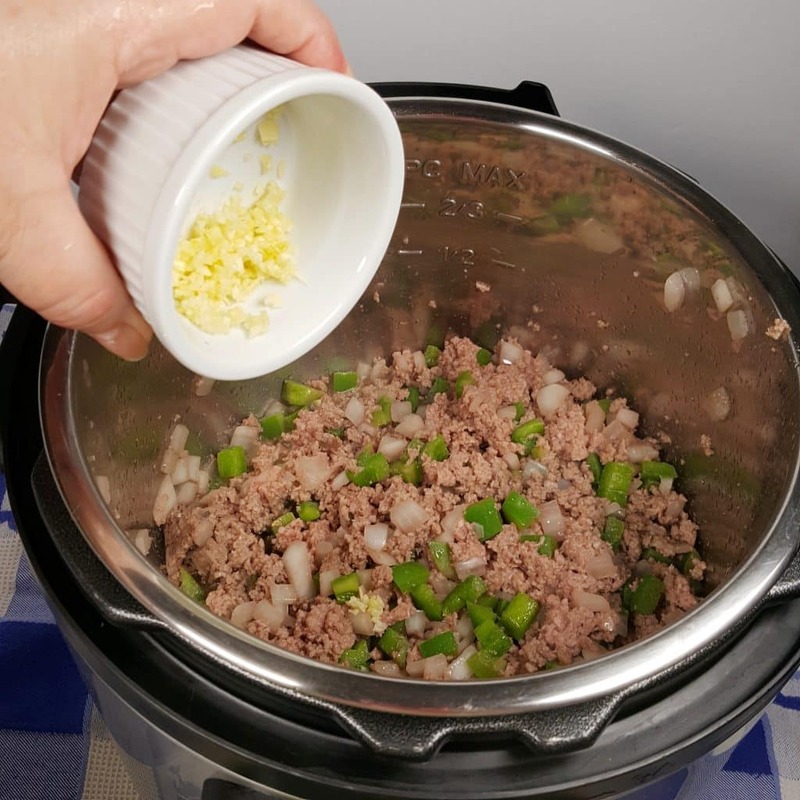 During pressure cooking, ground beef releases a little more grease, so draining off excess grease will ensure the Instant Pot Sloppy Joes are not swimming in grease, just flavor. Onions and green peppers release a lot of flavorful water, so cooking them with the beef, will infuse that flavor into the ground beef. Draining some of the liquid caused by the onions and green peppers leaves a nice flavor in the ground beef and gives a more mild flavor. You’ll have a nice mouth feel from the cooked peppers, but not an overbearing strong pepper taste. 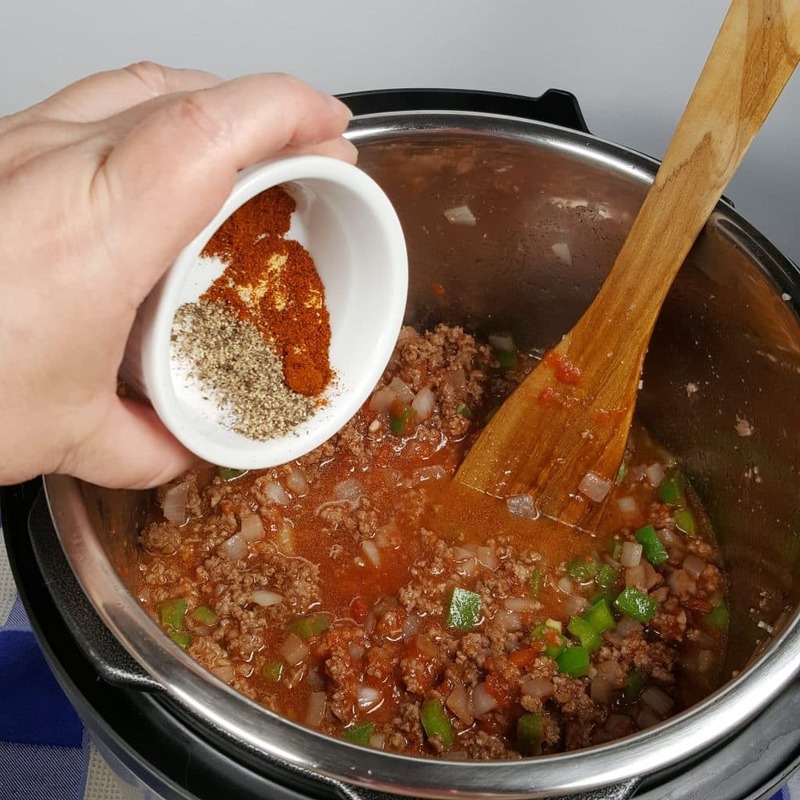 How to Strain Liquid from Instant Pot Sloppy Joes. After the meat is just partially browned, grab a Splatter Screen/Guard. Remove the cooking pot and carefully drain out the liquid into the sink. The grease is mixed with water, so, it shouldn’t be a problem pouring this down the drain. Unless, of course, you live in an RV, at which time, it is not a good idea. Okay, so this used to drive my dad crazy. I hate greasy food. When I was a kid, I loved to make Chili, in particular. Hey, I was just 10 years old and I could cook this all by myself. After browning the beef on the stove in a big pot, I would pour the meat into a colander and rinse out the fat. Then I would put it back into the pot and go from there. He used to tell me that I was rinsing out the flavor. Which I was, but it also got rid of the fat. So, my little method of browning with the veggies is kind of the best of both worlds. A lot of the fat is removed, without all the flavor. Use a good, sharp knife and mince the garlic very well. Again, because of the very short cook time, we want to make sure the Garlic is well incorporated throughout the Instant Pot Sloppy Joes. How long does it take to Sauté Garlic? It takes about 30 seconds to cook off the rawness of the garlic. It will mellow and let off a mouth-watering aroma. 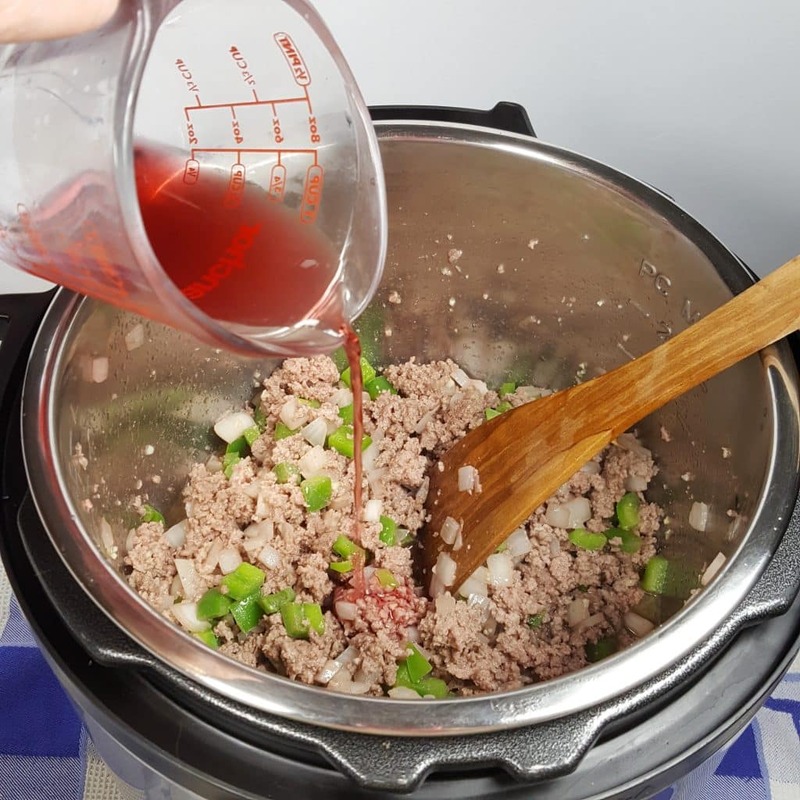 Why deglaze Red Wine Vinegar in Instant Pot Sloppy Joes? It is one of the ingredients to ketchup, as it adds acidity to balance the sweetness of the ketchup. Deglazing with red wine vinegar will help loosen any brown bits stuck on the bottom of cooking pot. Plus, while deglazing with red wine vinegar, the steam will release and cook off some of the very strong flavor. A good Red Wine Vinegar should be a staple in your pantry or refrigerator. There really is a method to my madness and a good reason for some of the “odd” things you might see me do. Sometimes order of ingredients matters and sometimes, it doesn’t. The dark brown sugar will melt nicely with the hot ground beef. Worcestershire sauce and tomato puree finish up the rest of the ingredients for homemade ketchup. Make sure to use tomato puree, not tomato sauce, as the puree has been cooked down and adds a deeper flavor and is thicker than plain tomato sauce. How do you make homemade Ketchup? What Seasonings are used for Instant ot Sloppy Joes? Freshly Ground Black Pepper – I use an Electric Pepper Mill and ground my own Pepper. These are typical pantry ingredients. I tagged them all, so you can check them out, just in case you have any questions. Just a little Simmer and you are good to go! 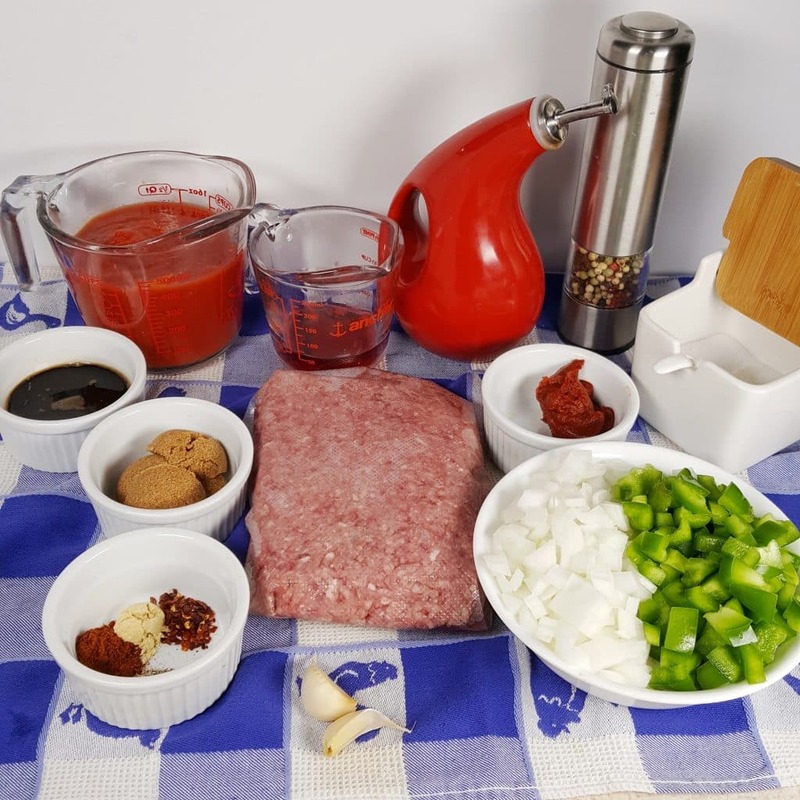 Depending on the amount of liquid you were able to remove, you may or may not need to Simmer the Pressure Cooker Sloppy Joes, after pressure is released. Make sure to use a Splatter Screen/Guard, or else the liquid will come popping out at you. Lightly butter some good sturdy hamburger buns and give them a light toasting. The soft squishy buns, while traditional, doesn’t hold up and will make a mess. Kaiser Buns are my choice. You can use an air fryer to toast the buns. I like to butter the insides and toast them in my Cast Iron Skillet and over medium heat. Add oil and coat the bottom of the pot. Add onions, peppers, garlic and ground beef. Pour in red wine vinegar and deglaze the cooking pot, if needed. Mix in Worcestershire Sauce, Brown Sugar and Tomato Puree. Add Salt, Pepper, Chili, Mustard, Red Pepper Flakes and Tomato Paste and mix together. Lock on Lid and close Pressure Valve. Cook at High Pressure for 3 minutes. When Beep sounds, allow a 15 minute Natural Pressure Release. Open Lid and Select Sauté/Browning. Simmer, until much of the liquid has evaporated and consistency is thick. Serve on Toasted and Buttered Kaiser Rolls or Sturdy Hamburger Buns. PIN this Pressure Cooker Sloppy Joes! You read my mind! My hubby absolutely LOVES Sloppy Joes, but I don’t really care for the canned stuff you make it with. This hits the nail right on the head and I have everything needed to make this without making another trip to the grocery store. So, guess what’s for dinner tonight! LOL! Thanks for another great recipe to make in my Instant Pot. 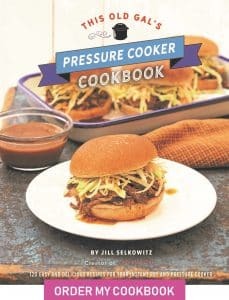 Jill, I made the Pressure Cooker Sloppy Joes and they were wonderful! These were so much better than any I have ever eaten and so quick and easy to prepare. The recipe made a nice batch and as there are only the two of us, I was able to put the rest in Ziploc bags and freeze for later meals. I took a bag to one of my coworkers and she loved them and wanted the recipe and I already had printed one for her. LOL! She’s going to make a batch up this weekend for her grand kids she said. I am really putting my Instant Pot to good use with your wonderful recipes. Thank you again for all your great recipes! Is there enough liquid to bring the put up to pressure to seal correctly?? Don’t you need to add a cup of water??? Growing up I never had the canned stuff and don’t like it to this day! This sounds awesome. I’m looking forward to using my IP to make sloppy joe’s. I like to add a touch of cinnamon to mine — not enough to make someone think “cinnamon? !” But a little bit just gives a depth of flavor and cr I love. I remember that from my high school cafeteria. My Mom was mad I like theirs better. They added a hint of cinnamom. I, too, love to add a hint of cinnamon to my sloppy joes. Just enough to add another layer of flavor but not enough that it really stands out. I’ve been wanting to make these lately and look forward to trying this IP recipe!! I drain my ground beef with my turkey baster. Don’t want grease in my drains and it works for fast and easy. I keep styrofoam cups to pour the grease into to toss. Great plumber and time saver. How long will left overs stay good in the fridge? Made this for lunch today, very tasty! We’re not fans of Mandwich so I usually just brown the meat and veggies and add bbq sauce. Your recipe is a nice change from our usual. The children have already deemed this a keeper 🙂 Thank you! HI! This is in my IP right now, but I wanted to note: If you sauteed and drained your meat separate from your veggies/garlic, you wouldn’t need to add flavorless water back in later. The flavored water would then season your drained meat, no? Personal preference, I suppose. That’s the only modification I made. It smells great and I can’t wait to try it! So delicious!! Easy peasy super tastey! Love this recipe. I have a 3 quart Instant Pot so made a half portion. I had most of this stuff at home already. Followed everything, but added some smoked paprika since it is sitting there since I made fondue almost 2 years ago. This was excellent! Thanks for the recipe. I left out the pepper flakes and cut back a little on the chili powder because we don’t like things too spicy. I didn’t have a can of tomato purée, so I blended a can of diced tomatoes— worked perfectly. Made these sloppy joe’s for dinner tonight. They were delicious! Served it on brioche rolls that I buttered and toasted. Served kernel corn on side. Even have leftovers, which my picky eater said he is planning to eat again. Thank you for a great recipe! I lost this but found today again. 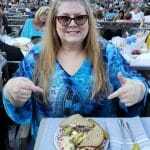 My mom was a gourmet cook but she couldnt make sloppy joes or fry chicken lol. 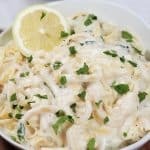 I love this recipe and usuall try and make a batch in hurricane season . Heat it up on the old fondue pot in emergencys. Great taste and so happy to find it again. Your a great cook. The best Sloppy Joes ever. 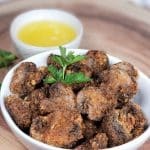 My wife had a craving and luckily I found this recipe. 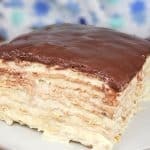 Easy and incredible delicious! !